Help! My Furnace Is Not Heating My Home! There is nothing more frustrating than waking up on a fall morning with no heat. While calling for professional help is the best thing to do for issues like this, there are simple fixes that you can perform yourself to save you some expenses. When a furnace does not produce enough heat, the most common causes probably lie in your thermostat, filter and the blower motor. Check out these easy fixes that are safe for you to perform. A dirty filter restricts airflow and disturbs the proper operation of your furnace. It reduces the amount of heated air that enters your home and that is the reason why you feel insufficient comfort indoors. Cleaning the filter in the fall is crucial in maintaining your unit’s efficiency during the cold season. ü Set the thermostat 5 degrees higher than the room temperature and see if the furnace kicks in. ü Clean the thermostat’s panel. Sometimes, electrical issues can cause furnace malfunctions. Be sure to check for tripped breakers in the fuse box. Your furnace might not be getting enough power because of them. There are also times that somebody has accidentally switched off the power so better check on them (especially if your furnace is located in the closet and tight places). If you see burnt switches, call an electrician for professional repair. Check the air intake and exhaust vents of your system. 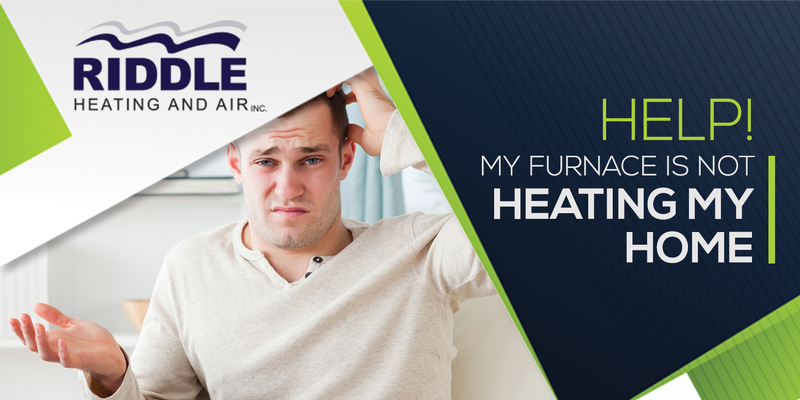 Sometimes, dust build-up, windblown leaves, and insects get stuck in them and cause your heating system to malfunction. If you have issues in the vents, call a licensed technician for proper solutions. You can always do these simple checks to diagnose a furnace issue. But if you have doubts, it only takes minutes to call our experts at Riddle Heating and Air Conditioning and schedule an appointment. Call us and we’ll take care of your furnace problems right away!